Methane (CH4) is a potent greenhouse gas that is roughly 30 times more harmful to the climate than carbon dioxide (CO2). Both gases are produced in thawing permafrost as dead animal and plant remains are decomposed. However, methane is only formed if no oxygen is available. Until now, it was assumed that larger amounts of greenhouse gases are formed when the ground was dry and well aerated—when oxygen was available. Christian Knoblauch and his colleagues have now demonstrated that water-saturated permafrost soils without oxygen can be twice as harmful to the climate as dry soils—which means the role of methane has been greatly underestimated. Knoblauch has, for the first time, measured and quantified in the laboratory the long-term production of methane in thawing permafrost. The team had to wait for three years before the approximately 40,000 year-old samples from the Siberian Arctic finally produced methane. 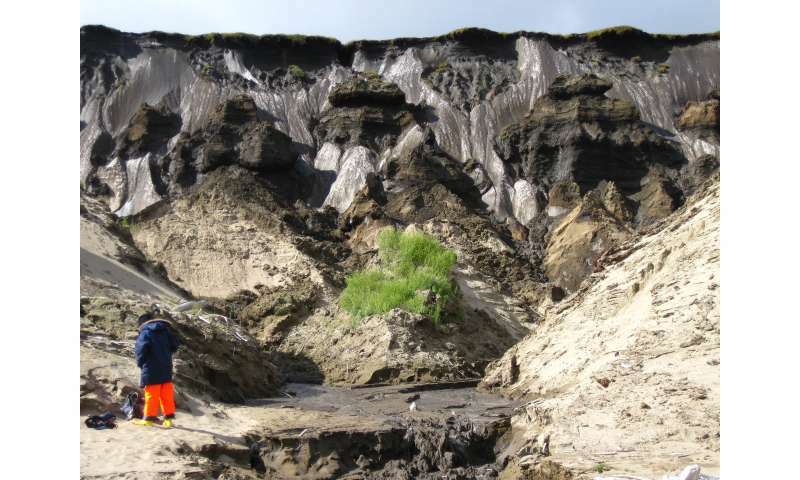 The team observed the permafrost for a total of seven years, an unprecedented long-term study. They found that without oxygen, equal amounts of methane and CO2 are produced. But since methane is a far more potent greenhouse gas, it is more significant. Because methane production couldn't be measured, it was assumed that in the absence of oxygen only very small amounts of it can be formed. "It takes an extremely long time until stable methane-producing microorganisms develop in thawing permafrost," explains Knoblauch. "That's why it was so difficult to demonstrate methane production until now." "By combining process-based and molecular-microbiological methods, our study shows for the first time that the methane-forming microorganisms in the thawing permafrost have significant influence on the greenhouse gas budget," adds co-author Susanne Liebner from the Helmholtz Center Potsdam—GFZ German Research Center for Geosciences. The team has used the new data to improve a computer model that estimates how much greenhouse gas is produced in permafrost in the long term—and they've compiled a first forecasts. According to the scientists: The permafrost soils of Northern Europe, Northern Asia and North America could produce up to 1 gigaton of methane and 37 gigatons of carbon dioxide by 2100. But there are uncertainties. To what depth will the soil actually thaw by then? Will it be wet or dry? One thing, however, is certain: the new data will enable more accurate predictions about the impacts of thawing permafrost on our climate. Methane (CH4) is a potent greenhouse gas that is roughly 30 times more harmful to the climate than carbon dioxide (CO2). What does that mean? I t certainly doesn't tell us how much methane will run-up global temperatures. Methane has been tracked since 1984. We know it's concentration, infrared absorption spectrum and we know how much it's increasing every year. We also know the basic physics of the green house gasses, but what we don't seem to know, at least we are NEVER told is how much methane will run-up global temperatures. The reason for that is probably because it isn't very much, most likely not even measurable. Well really, do a Google search and see if you can find out out much methane, business as usual, will run up temperatures by 2100. You will come up empty.